Run Conversion - Runs the conversion process. You can view the conversion results in a form of a database table after the process has finished. Click on the Browse button ( ) button on the output pane to see the results. If no output data source is selected through the output pane, the results of your conversion are saved into a temporary database table. Task Scheduler... - Use the Task Scheduler to run any TextConverter or other TARGET project on a schedule. 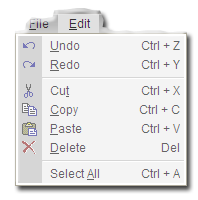 The edit menu provides support for Cut, Copy, Paste, Delete, and Select All. Undo and Redo are not available in all areas of TextConverter. 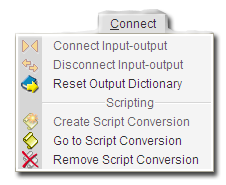 Undo and Redo are fully enabled in the script editing pane. 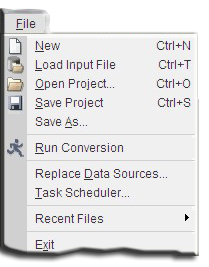 Project properties appear in the Preview Options pane. You can store notes about the project and other associated information that is not otherwise accommodated. When you run a process a log file is generated at %temp%target_process_n.dbf that lists what happened when the process was run. The log path - is shown and can be edited under "View" "Project Properties". Single instance project (scheduled tasks) check box - TextConverter Professional Edition and TextConverter Developer Edition allow projects to be run in the background, either from the scheduler or from another script or process. Leave this unchecked for to allow concurrent instances of the same project. Check this box if you do not want more than one instance of this project to run in the background at the same time. Instances run with the authoring tool, that is through the user interface, are not effected by this check box. Back files Path - this specifies the location for back-up files. If no path is entered back-up (.bak) files are stored in the same directory with primary files. Admin emails - this specifies the e-mail address for error messages. SMTP without ssl is assumed. Some custom configuration may be required to use this option. Comment - store a note about the project here. 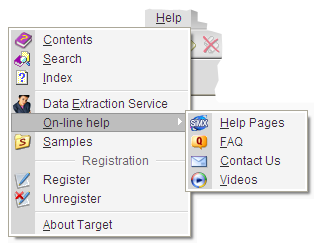 The help menu provides access to the off-line help files through Contents, Search, and Index. It also allows you to access SiMX's Data Extraction Service where you can submit an input file and receive back a fully configured project and acess to on-line help. The on-line help pages are similiar to the off-line help pages but contain the most up to date information. Samples displays all of the sample projects installed with your software. From the help menu you can also Register and Unregister your software, and find your version with About Target. (Note: TextConverter and TARGET Reports always have the same most current version number because they are both parts of the SiMX's TARGET platform.) To find the current distribution version, visit www.simx.com and click "Support".